My Little Slice of Bliss: A Little Message for You . . .
Greetings, my friends! Today the DeNami Design Team is sharing designs over on the DeNami Design blog that show off the stamp in this week's Product Spotlight: Little Fawn. And boy, what a cutie this one is! My sentiment is DeNami's A Little Message for You stamp. I added a boutique button and some orange rhinestones, along with a chevron arrow trimmed from one of my selected sheets of patterned paper. Be sure to check out the rest of the team's lovely creations today on the DeNami blog. Like what you see? 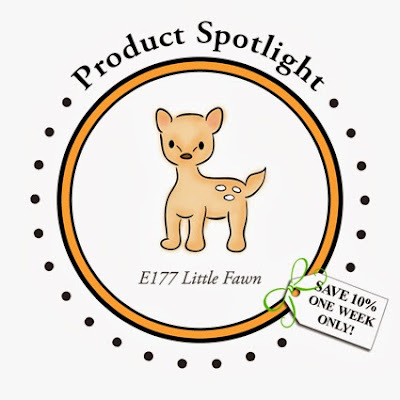 Then you can score a great deal on this sweet woodland critter--as our Spotlight Product, it's on sale at 10% off for the next week!! I love the off the paper design! Love that sentiment too with this card too! Fabulous papers....Love it all Emily! Cute, cute little deer and super papers. Love that chevron arrow, too. I love the way you combined the papers, then added the gems. So pretty. The fawn is so sweet. Darling image and love the arrow and scatter of sequins. Emily, great choice to keep your stamped images uncolored. I love your mix of papers. Awesome card! This is too cute Emily, love the DPs!! Hi Emily!! What a darling card! I love the papers and embellishments you used, and the deer is a cutie!! STELLAR card, Emily. :) Looks fit for the pages (er, um, digital bytes) of Paper Crafts Magazine! Your card is so cute! I love how the little fawn turned out stamped on the kraft cardstock. A sweet way to send a little message off to a friend. Emily, this little guy is too to cute for words!! The whole design says a warm happy hello!